THE NIBBLE. Last year, strolling through the farmers market at San Francisco’s Ferry Building, we met a farmer who grew fresh sage and turned it into sage tea. It was splendid, but we lost her card and never ordered any. Good karma brought a tin of Rishi Tea’s organic Bergamot Sage Tea, a blend of sage, peppermint, bergamot and lemon thyme. It may be even more splendid! Rishi organic teas are also certified kosher. 1. Per cup, steep 1 tablespoon dried sage in 8 ounces of boiling water. 2. Enjoy plain or add a bit of agave nectar or honey. 3. If you have fresh sage in the garden or left over from another recipe, by all means use it (but use twice as much fresh sage as dried sage). 1. You can simply chill the sage tea. 2. Or, make a variation of an Arnold Palmer, the famed golfer’s favorite drink: half iced tea, half lemonade. To each glass of iced tea, add the juice of 1 lemon (we add the grated rind as well). Drink plain or sweetened to taste. 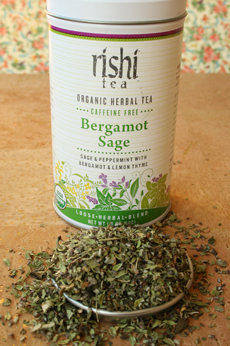 Sage has long been an herbal remedy for sore throat and mild gastrointestinal upset, but we now drink Rishi’s Bergamont Sage tea daily because it’s soooo refreshing.